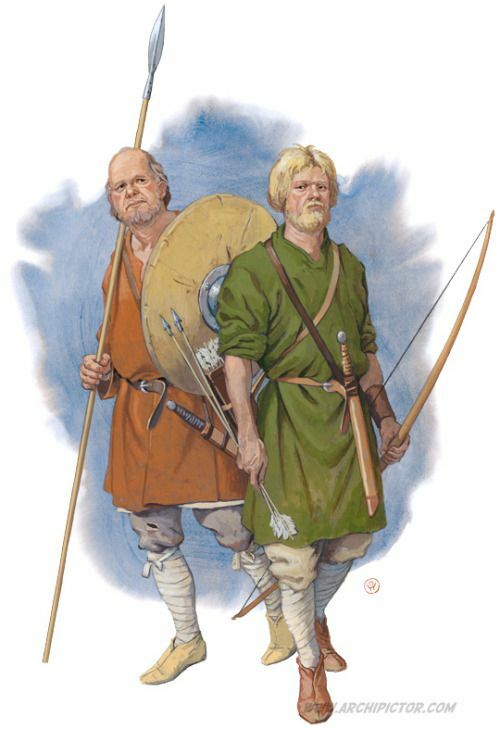 Two Saxon warriors – realistic portrayal of the sort of warrior farmers who entered the former Roman province of Britannia in numbers, in the fifth century AD. It is obvious that the sequence pagan England–Augustine of Canterbury–Christian England is hardly an approximation to the reality of seventh-century history, even to the events as we know them. But it is easy to forget how unsteady the early decades were. In Kent Queen Bertha had been celebrating mass for the best part of a generation in her chapel at court before her husband followed suit; and when he died their son relapsed to paganism for a time. A similar relapse befell Essex on the death of its king Sæberht, at about the same time. To judge from the grave furniture at Sutton Hoo, Rædwald of East Anglia was planning to keep his options open at his death in the 620s and the Christian cause was to suffer a serious setback in the Northumbrian kingdoms within its first ten years. But this was the world of the warrior code and of ring-giving lords: for the fighting men on all sides, Christian or pagan, British or Saxon, the struggle was as important as the outcome. The year that Oswald of Northumbria stood sponsor at his baptism, Cynegils of Wessex led a victorious campaign into the recently Christian kingdom of Essex (according to Bede, the East Saxons had relapsed into paganism and this was their punishment). When Cynegils died in 643, Wessex once again found itself under pagan rule as his son Cenwalh flirted briefly in alliance with Penda of Mercia, taking the pagan king’s sister as his queen and then, for reasons best known to himself, separating from the queen; her furious brother drove him from his throne. Cenwalh found exile with the East Angles where he reconverted to Christianity. When he recovered Wessex in 648 he founded the minster of St Peter’s, Winchester, and, with the installation of the Frankish churchman Agilbert, seemed to have secured the new faith in Wessex. Cenwalh (d. 672) continued to ply the royal trade of war leader. Success in the 650s against the Christian British/Welsh near Bradford on Avon and the annexation of areas of what is now Wiltshire and Somerset, was followed (661) by humiliation at the hands of Mercia as its new, now Christian, king drove a triumphant campaign south to occupy the Isle of Wight. The West Saxon dynast seemed in eclipse. His widow Seaxburgha, the only queen regnant of the Anglo-Saxon period, held the centre until her own death in the early 670s. In the next decade the throne was seized by a pagan warrior claiming descent from the royal house, despite his apparently Celtic name of Cædwalla. In three ruthless years (685–8) he conquered the kingdoms of Kent, where he installed his brother Mull, later burnt alive in a general uprising, and Sussex, recently converted by the exiled bishop Wilfrid of York. He, it seems directed Cædwalla to Christianity; he certainly received large estates in the Isle of Wight, which the king also conquered. Cædwalla’s origins are obscure, his military success indisputable. It guaranteed him the spoils of war and the kind of fame as lord and ring-giver that in turn guaranteed followers. Like Guthlac, Cædwalla adopted the life of faith. He had lived as a pagan warlord but his return to the new religion confirmed it in Wessex beyond further question. In 688 he abdicated the throne he had seized and went, a pilgrim, to Rome; one of the first of the many English kings to do this. There he accepted baptism and, ten days later, died. 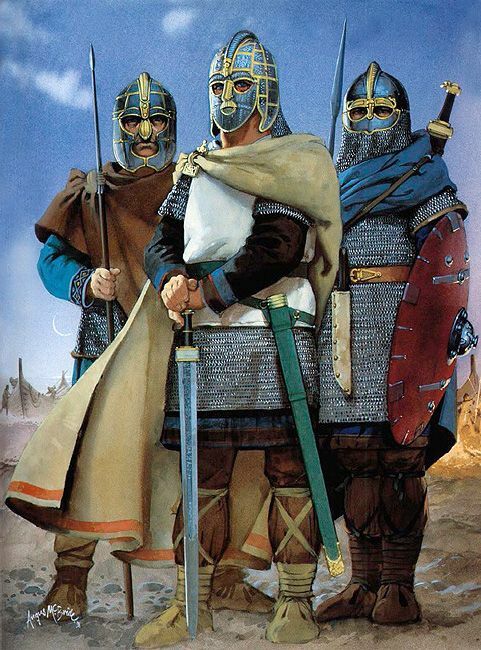 Thanks to the archaeologist, the early medieval king-warlord and his war band of companions or gesiths stand before us as men of extreme wealth and extravagant display; ostentatious on the battlefield and in the pomp of death. The largest pieces of equipment, helmet and shield, are at the same time the most majestic emblems. (Though even here makers might attempt to cut corners. King Æthelstan’s Grately code (c. 930) warned shield-makers not to use sheepskin, in place of true leather.) Made of wood and covered with tan-toughened leather, the heavy round shield, up to three feet (91 cm) in diameter, mounted with a central boss to deflect blows or be used as a bludgeon at need, could be a weapon of offence as well as defence. It was also a platform for display. Relief ornaments, in copper with applied silver-sheet embellishments, are exquisitely worked in animal forms – birds of prey, for example, or reptilian bodies – reminiscent in shape of the creatures that inhabit the scrolls and tendrils of the monks’ illuminated manuscripts, and mounted seemingly at random for maximum decorative effect, but almost certainly in arrangements that conveyed symbolic meanings to the initiated. For the fighting man himself the sword was surely the most valued tool of his trade in practical, but also in almost mystical, terms. The Beowulf poet writes of a sword treasured from the days of the giants, the envy of warriors, that only the hero himself could wield. As in the samurai culture of Japan, such high-status swords might pass through many hands, possibly as a gift from lord to gesith, possibly from father to son, certainly at the highest social level. They might be embellished, sometimes by successive owners, with gold fittings or other rich ornaments. The sword-smith was highly rated in this warrior world: a craftsman of the highest calibre and respected social status. In the law code of Æthelberht of Kent the killing of the king’s smith commands special compensation. As in many African traditions, the ironworker as such was held to be under divine patronage and, like the Roman god Vulcan, the legendary Weland the Smith of the Anglo-Saxons was lame. But whereas Vulcan was born so, Weland, it was believed, had been crippled deliberately by a king to prevent his escape from the royal smithy. In the early centuries, the finest swords were produced by ‘pattern welding’. The process, as depicted by Kevin Leahy, begins by twisting strips of iron of the required length and then hammering them into flat ribbons. Four such ‘ribbons’ are next fire-welded onto an iron core and hammered out so that the twist marks, flattened into oblique lines, may create a chevron or ‘herringbone’ pattern. A strip of steel is next welded to either side of the core unit to provide the cutting edges. These are now ground and the whole polished to bring out the chevron effect – the blade’s badge of fighting quality and inherent value. By the mid-ninth century, though, furnace improvements and refinements of the smith’s technique made possible the production of quality blades without the need for pattern welding. Weapons of all kinds, such as spears, light throwing axes or short single-edged dagger-swords (seaxes), which according to one tradition gave the Saxons their name, and, less frequently, swords, are excavated as grave goods and it seems reasonable to assume that the bones with which they are found are those of a warrior whose social status and fighting specialisms can be deduced from their presence. But, by an extensive analysis of some 1,660 male burials in Anglo-Saxon cemeteries, concentrating on sword-bearers, Heinrich Härke of Reading University concluded that this does not necessarily follow. For example, some ‘weapon burials’ were those of children aged as young as twelve months, and some of men too severely disabled ever to have seen action. Then there were skeletons presenting combat wounds but not accompanied by weapons of any kind. Such facts and others have long persuaded scholars that weapon burials had a largely symbolic meaning. But Dr Härke has proposed a further hypothesis. Analysis shows that those adult males buried with weapons tended to be up to two inches taller than those without – more or less the height difference revealed, by other studies, as that between the Anglo-Saxon and Romano-British populations. Härke has argued that the [taller] immigrant Germanic [community] ‘used weapons in the burial rite . . . perhaps . . . to demonstrate that they were ruling [the land] by force; a material culture version of the conquest myth’.16 But it could be that these opulent inhumations, which would have had to be highly public events to make such an aggressive demonstration, were, rather, exclusive family memorials to kinship solidarity. The ceremony attending the baby boy buried with the family sword ‘that any warrior would envy and only a hero could wield in battle’ would, surely, have been one of howling private grief, not of ethnic triumphalism. The eighth century opened promisingly for the kingdom of Wessex. The name was coming into general use for the territory stretching from the lands of the Gewisse people, around the upper Thames, southwards to the coastal lordship established by the semi-legendary Cerdic two centuries earlier. It is not clear how or by whom the two regions were united, but the ruling dynasty held to the title of the Cerdingas. With King Ine (688–726) the historic heartland kingdom of the later Anglo-Saxon period secured its own core territories. The men of Kent were forced to pay compensation for the killing of Mull; Surrey was effectively a frontier province (bordering on Essex); while Sussex, it seems, was generally a biddable ally helping Ine in a campaign against the British king Geraint of Dumnonia. The reign of Ine remains important for his law code, the first by a Wessex king, which survives as an attachment to the code of Alfred and holds the first references to the shire court presided over by a royal agent or scirman (‘shireman’). It seems that the core West Saxon shires of Hampshire, Wiltshire, Dorset and Somerset, though based on existing administrative subdivisions, may have been established under this king. By a wide margin the Western world’s oldest organs of local government still functioning, the West Saxon shires were already, in the classic English manner, of different type. The first two take their names from royal residences (vills) at [South] Hampton and Wilton. Dorset and Somerset, on the other hand, were named for the local folk, the settlers (sæte), in the vicinity of the forts of Dorchester and Somerton. Ine’s laws are concerned that a malefactor might escape his lord’s control by getting into a neighbouring shire. Apparently ‘crossing the county line’ has been an option for fugitives from justice for well over a millennium. The shire with its subdivisions, such as the hundreds, was headed by a royal appointee originally in Wessex known as an ‘ealdorman’, though the term in general came to denote an official of higher status; by the year 1000 most of England had been divided under successive rulers into shires, each with its royal official known as the scir gerefa (the ‘reeve’), an administrative officer of the shire (certain Canadian municipalities still have an official known as ‘reeve’). The modern English sheriff has limited, often ceremonial functions. In the US his equivalent, inherited from the colonial period, remains an important local law enforcement officer. Familiar to all aficionados of the Western film, at the time of the western frontier the sheriff was empowered to recruit a ‘posse’ of the county’s citizenry to help him at need. Like the man, the term derives from medieval England, from the (post-Conquest) Latin posse comitatus, the ‘force of the county’. In some US states the posse may still be deployed as a citizen police force, to patrol shopping malls, for instance. It is also under Ine that the term ‘ealdorman’first appears in West Saxon documents, the first West Saxon coins were minted and the king first began to interest himself in commerce. In fact, it appears that King Ine, whose laws on the regulation and protection of foreign merchants encouraged the commercial development of Wessex, probably stimulated the kingdom’s economy by the carefully planned development of the port of Hamwic, adjacent to the royal vill of Hampton. Population was resettled from the surrounding countryside; gravel and other building materials were shipped on site at the king’s expense; and a new port was ready to join the international Channel–North Sea network of centres, given the generic name of ‘emporium’ (plural ‘emporia’) by historians of the period. In the 710s Boniface of Crediton, then a monk at Nursling, en route for his mission to Germany, twice went by road to Lundenwic (London) to make the sea crossing from there. As a Wessex man he may have considered himself to be still on home territory. In the early 700s the law code of King Ine mentions the East Saxon Eorcenwold, bishop of London, as ‘our bishop’, which suggests that the West Saxon king considered he had a controlling interest in the place. Twenty years before that, a reference in the Kentish law code refers to the ‘king’s hall’ and the king’s wic gerefa (‘wic reeve’) – presumably the hall within the Roman city area and the reeve based in the wic (or trading area) to watch over the king’s interests in the emporium’s trade. Given its place on the Thames and at the convergence of many frontiers, and its status as an international emporium, we can assume that all adjacent authorities wanted their fingers in the honeypot and that London’s merchant magnates knew how to restrict access. Although large numbers of Anglo-Saxon immigrants followed the initial raids . . . [or wars, we might say, such as that of Ine and his Sussex ally against Dumnonia] and settled across England . . . the bulk of the population, especially in the west, must surely have remained Romano-British stock. The original name of the minster of Malmesbury was Maildubhi Urbs the ‘city’ of Maildubh, in Old English Maeldubh’s burh, and tradition holds that it originated around the hermitage of an Irish monk of that name. Irish monks may also have had a presence at Glastonbury. Certainly non-Roman Christianity was strong in the region. About 700 we find Aldhelm, writing to King Geraint of Dumnonia, spelling out the Roman way of calculating the date for Easter and urging that his British clergy adopt it. The approach to the West Country ‘Celtic’ Christians seems to have had some success. Bede claimed that the British already within the West Saxon borders were convinced of the Roman way. Apparently, however, the British across the Severn, the Welsh, refused to eat with ‘the Roman party’ and imposed a penance of forty days on priests who had anything at all to do with the Romans. One of the pillars of Anglo-Saxon spirituality in Wessex was to be the new foundation at Wimborne, inaugurated with King Ine’s sister Cuthburg as its first abbess. Married for a time to King Aldfrith of Northumbria (685–705) and later a nun at Barking in Essex, she lived a career typical of the kind of networking that was possible for women between the kingdoms of the Heptarchy. Dynastic rivalry was also part of the royal scene and, though Ine fended off his rivals, such family feuding would return sporadically to disrupt later reigns. Like his predecessor, Ine abdicated to make the pilgrimage to Rome, where he would die. Men said it was he who founded the Schola Saxonum, the English quarter near St Peter’s. In a reign of some forty years he had maintained the prestige and standing of Wessex and opened up the field of royal government beyond the activities of warlord and conqueror. The Chronicle tell us that Ine was followed peacefully by a kinsman who ruled from 726 to 740. A family member named Cuthred, in turn, succeeded him. There is evidently drama behind the brief entries for these decades. We learn that in 733 Æthelbald, king of Mercia, captured the West Saxon royal vill of Somerton and that in this year the sun looked like ‘a black shield’. Seven years later, Cuthred took the war to Æthelbald. Three years after this the two men were allies against the Welsh. For a time Cuthred was endangered by domestic rivals and no doubt he faced other threats not recorded in the Chronicle’s terse chronology. In fact, between the seventh and the ninth centuries, the rule in Wessex rarely seems to have passed from father to son; perhaps the succession should be rather understood as an almost institutionalized pattern of challenge and counter-challenge among families of the establishment who laid claim to descent from Cerdic. In the year 752 Cuthred went against Æthelbald once more and this time ‘put him to flight’. Four years later, Cuthred died. There followed twelve months of conspiracy and murder among the ruling establishment, in which the new King Sigeberht was driven from his throne by his successor Cynewulf. Forced to flee, an outlaw, into the forest of the Weald, he was assassinated by a herdsman – on Cynewulf’s orders, it was supposed. The next thirty years belong to Cynewulf who, we are told by the Chronicle, could trace his paternal ancestry in direct line back to Cerdic, and who fought many ‘great battles’ against the Britons. For all that, one of the longer, and it would seem more successful, reigns in English history receives little attention from the Chronicle bar the mention that it ended with the king’s murder by Cyneheard, the brother of Sigeberht, whose own death Cynewulf too had contrived some thirty years previously. Cyneheard too was killed and the succession was secured by Beohrtric, another direct descendant of Cerdic. He may well have owed his throne to Offa of Mercia; he married his daughter. Beohrtric was opposed by Ecgberht, connected with the West Saxon and Kentish royal lines, and grandfather ‘to be’ of Alfred the Great. Although Wessex won a momentary independence, Ecgberht was driven from ‘the land of the English’ i.e. England by Beohrtric who was assisted by Offa, and Ecghberht was forced to live at the court of Charles the Great, king of the Franks, for several years. No doubt the overbearing Mercian looked upon Wessex as at best a client kingdom, at worst a subject province. According to King Alfred, who recounted the tradition to his biographer, Asser, many years later, Eadburh’s malevolent period as royal consort explained why the wife of a West Saxon king was never consecrated queen. A true daughter of her father, she ruled the court circle by tyranny and intrigue, but had to flee the country when a plot misfired and she almost poisoned her husband. Whether any of this was true (was she following instructions?) or whether we are dealing here with a simple case of misogynistic gossip, the kings of Wessex did not, after her time, honour their wives with the title of queen and held their ceremonial ‘crown wearings’ in solitary state. It was a change from earlier times. In the seventh century the West Saxons had been briefly ruled by a queen regnant and as late as the 740s a king’s wife was witnessing charters as ‘regina’ (‘queen’). Beohrtric’s reign (786–802) witnessed an event of terrible omen for the English. ‘In these days’, records the Chronicle, ‘came the first three ships of Northmen’ – it seems they may have been from the region around Hardanger Fjord in western Norway. One report has them landing at Portland. The king’s gerefa rode out to meet them because he did not know what they were, although, presumably they were not traders, since otherwise they would have been heading for Hamwic. Maybe they had steered a wrong course. It was the reeve’s duty to have newcomers report themselves to the king’s town. They killed him. The events of 1006 were typical of the calamity that befell England between 980 and 1016: a generation of escalating misery during which time Viking armies roamed practically unopposed across the rolling hills of southern England, looting and burning at will. A sense of the scale of the violence can be gauged simply by the number of conflicts recorded, particularly once the eleventh century got under way. Across England, there were (give or take) eighty-eight instances of armed violence recorded in the written record in the thirty-five years up to and including 1016; this compares with fifty-one conflict events recorded over the whole of the preceding eighty years. For the people of southern England, whose experience of Viking incursions had dissipated in the early tenth century, it would have felt as though a forgotten nightmare had dragged itself upright from the mire – a revenant horror, long thought staked and buried, stalking abroad once more. 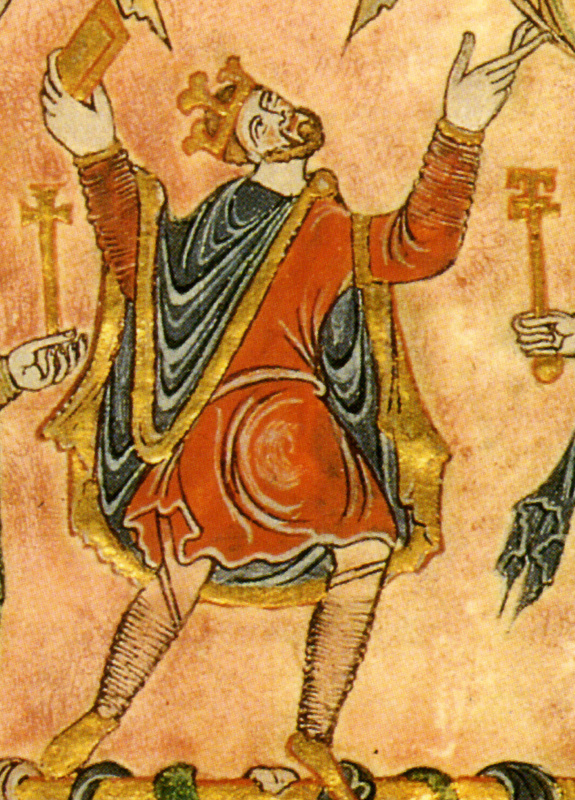 There are, of course, some issues here about the trustworthiness of the written record – chroniclers sometimes had a vested interest in minimizing or exaggerating the travails of various monarchs – but it is evident that the quarter-century after Eric Bloodaxe’s death in 954 had been noteworthy for its stability, its lack of dramatic incident. This seems, in large part, to have been down to the firm grip of one king – a man largely forgotten today, but with a good claim to being one of the most successful and impressive of the Anglo-Saxon kings of England: Edgar pacificus – Edgar the Peaceful. It is a name that conjures up images of quiet and contemplation, a just and gentle ruler whose benevolent rule would usher in the golden age of peace and plenty that twelfth-century chroniclers imagined he and his subjects had enjoyed. It was they, however, and not his peers, who conferred the epithet pacificus upon him: his contemporaries would take a rather different view. King Eadred died in 955, one year after seeing his rule extended, formally and finally, to include Northumbria within the English kingdom. He was succeeded by his nephew Eadwig, Edmund’s son, but he died in 959 and was succeeded by his brother, Edgar. The most famous achievement of Edgar’s reign – and the one incident for which he is chiefly remembered – came towards the end of his life. In 973, he arrived at Chester with – according to the Anglo-Saxon Chronicle – his entire naval force, there to meet with the other principal rulers of Britain. Different Norman historians give varying lists of the potentates who were present, but probably among them were Kenneth II of Scotland, Malcolm of Strathclyde, Iago ab Idwal Foel of Gwynedd and Maccus Haraldsson, whom William of Malmesbury called archipirata (‘arch-pirate’) and others referred to as plurimarum rex insularum (‘king of many islands’ – probably Man and the Hebrides). No doubt there were serious and practical issues to discuss – matters of borders and security and the safety of shipping and trade and so on. What Anglo-Norman historians saw fit to record happening there, however, was a most extraordinary spectacle: at least half a dozen of the most powerful men in the islands, cowed into submission by Edgar’s majestic presence (or, more likely, the menacing presence of his enormous war-fleet), rowing the English king in a barge down the River Dee. It was a very physical, and very public, demonstration of what it meant to be a ‘little kinglet’ in Edgar’s Britain. It may be that the way this incident was reported in Anglo-Norman sources was deliberately intended to promote an anachronistic idea of English superiority – issues of insular power dynamics were very much alive in the twelfth and thirteenth centuries and, indeed, have never really gone away. But there is little doubt about who was at the top of the British political food chain in the 970s and, regardless of the details of what took place, it seems likely that the meeting was partly concerned with thrashing out issues of precedence, of putting lands, people and princes into their rightful places; for Edgar seems to have been a king who was obsessed with order. His laws reveal an administration that was determined to regulate and reform – creating nationwide standards of weights and measures and ensuring that coinage was made to uniform standards everywhere it was produced: gone were the idiosyncratic designs of the old Viking kings at York. Edgar’s coinage would look and weigh the same, whether it was minted there, or in Exeter, Chester, Canterbury, Lincoln or Norwich (or anywhere else that coins were made). He was also interested in bringing the whole of his realm into administrative harmony and ensuring that justice was both available and correctly applied. Wessex had long been organized by shires and hundreds, but everywhere else had had different (though perhaps similar) systems of organization. Edgar – perhaps drawing on precedents set by his immediate predecessors – formalized this system, creating new stipulations for the way that courts were held at the hundred (or wapentake in ‘Danish’ areas) and shire level, making attendance obligatory for the land-holding class. What really cemented Edgar’s legacy, however, was the unprecedented period of peace and stability that England seems to have enjoyed until his death in 975. It was a peace that was achieved to a certain degree at the expense of others: repeated punitive raids into Welsh territory demonstrate that Edgar, despite his nickname, was no pacifist. (Indeed, pacificus can be translated as ‘Pacifier’, just as it can as ‘Peaceable’ or ‘Peaceful’.) It was also a peace paid for through unprecedented investment in the kingdom’s naval defences: during his reign the number of English warships, according to later accounts, reached an improbable 4,800, and it is likely that reforms to the manner in which ships and mariners were recruited and obliged to serve the king began during Edgar’s reign. It also seems likely that the king’s naval power was founded in part on paid fleets of Viking mercenaries. The swelling of English royal authority may have meant that, for some Viking war-bands plying the seas around Britain, the risks of plunder were becoming intolerably high, while at the same time the wealth that the English king commanded may have become an increasingly attractive source of patronage to those prepared to work for him. All of these achievements added up to what most medieval writers felt constituted a ‘Good King’: he enforced justice, brought prosperity, upheld the Church and bullied and humiliated all the other (non-English) inhabitants of Britain – especially the Welsh. This was the sort of thing that was guaranteed to ensure a favourable write-up, and indeed his obituary in the D text of the Anglo-Saxon Chronicle is largely comprised of effusive praise. And yet, in the eyes of the chronicler – almost certainly Archbishop Wulfstan II of York (d. 1023) – all of his achievements were undermined by the ‘one misdeed […] he practised too widely’. King Edgar, Wulfstan disgustedly reveals, ‘loved foul foreign customs and brought heathen habits into this land too firmly, and he enticed outsiders and lured dangerous foreign-folk into this country’. This censure may have stemmed in part from the pragmatic and conciliatory approach that Edgar adopted. Large parts of his realm had been settled by people of Scandinavian origin for over a century, producing a mixed population whose tastes, trading connections and family ties were as intimately tangled with the wider North Sea world as they were with the populations of Winchester, London or Canterbury. Edgar understood that local interests and national cohesion could be jointly served by recognizing the distinctiveness of local laws and customs in those regions which had become – in Anglo-Saxon parlance – ‘Danish’. In his fourth major law code, Edgar promised that ‘there should be in force amongst the Danes such good laws as they best decide […] because of your loyalty, which you have always shown me’. The sudden shift from third to second person feels clumsy when written down, but read out loud at a Northumbrian wapentake or north Mercian thing-site, it may have had real dramatic force: that sudden turn to the camera, the steady eye contact that the pronouns imply, delivered a disarmingly direct and personal address from the king exclusively to his Danish subjects. In some ways, this recognition of a separate and parallel legal tradition stands at odds with Edgar’s stated intention (in the same code) to create laws for ‘all the nation, whether Englishmen, Danes or Britons, in every province of my dominion’. But, seen more broadly, this limited concession (it does not seem to have overruled all the king’s other edicts relating to coinage and administration) can be understood as the product of a keen political intelligence, one that recognized that – in the long term – the cause of national unity was better served by establishing trust and mitigating grievance than by lumbering authoritarianism. The result was the real ‘Danelaw’, a practical solution intended to bring the most reluctant of his new subjects willingly inside his vision for a coherent and cohesive English state. Attitudes towards strangers in Anglo-Saxon England had not always been kind, but xenophobia seems to have peaked in the late tenth century, perhaps buoyed by the rising sense of English identity that had been growing since the reign of Athelstan but conditioned over two centuries of Viking depredations of one sort or another. For his own part, the king seems to have been alive to any threat that such sentiments could pose to the peace of his realm (and his revenues). In 969, ‘King Edgar ravaged across all of Thanet,’ apparently because the locals had roughed up some Scandinavian traders. Hostility to foreign nationals on England’s estuarine outposts has a distressingly long history, but few have responded so robustly as Edgar. According to the Norman historian Roger of Wendover, the king was ‘moved with exceeding rage against the spoilers, deprived them of all their goods, and put some of them to death’. It was presumably this sort of thing that so offended Archbishop Wulfstan. In 975, however, he would doubtless have been relieved to discover that no longer would he have to endure the ‘foul foreign customs’ that Edgar had so perversely enjoyed. For in that year the king died. He was thirty-one years old. There followed a disputed succession and the short reign of Edgar’s son Edward, known as ‘the Martyr’ – the last of the long line of ‘Ed’ kings. When Edward died in March 978, he was replaced by his brother Æthelred. The new king was only a boy of twelve, but he came to the throne already in shadow, his people divided in their loyalties: Edward had died, not of natural causes like their father, but at the hands of men loyal to Æthelred, done to death at Corfe (Dorset). Whether the new king was himself complicit in the killing has generally been doubted by historians, but it can have done little to endear those people to him who had supported his brother’s claim. Even as stories of Edward’s (improbable) sanctity and martyrdom began to spread, so Æthelred’s reputation was stained – like Eric’s – with fratricide. Little that occurred over the following forty years would help to restore it. Belisarius under the walls of Rome by AMELIANVS on DeviantArt. Part of Justinian’s wars of Reconquest. 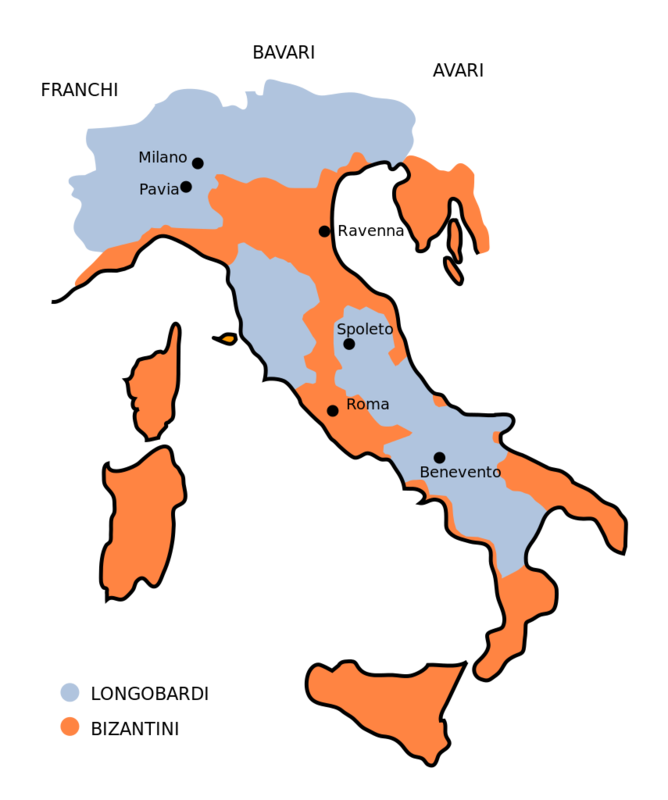 Italy about 575, Byzantine possessions in orange. The great Italian historiographer Arnaldo Momigliano recounted that, when he wanted to understand Italian history, he caught a train and went to Ravenna. ‘There, between the tomb of Theodoric and that of Dante, in the reassuring neighbourhood of the best manuscript of Aristophanes and in the less reassuring one of the best portrait of the Empress Theodora’, he could begin to feel what Italian history had ‘really been’. The presence of a foreign rule, the memory of an imperial pagan past, and the overwhelming force of the Catholic tradition have been three determining features of Italian history for many centuries. These three features first joined together when Ravenna became the capital of the Ostrogothic kingdom. It is an idiosyncratic passage but also an illuminating one so long as we remember that he was not really writing about ‘Italian history’ but about the history of what happened in the Italian peninsula. The Goths, Lombards and Franks of the old ‘Dark Ages’ were fighting not about Italy but for territory they wanted to conquer and settle. As for the Byzantines, foes of the first two barbarian invaders, they fought because they, the Roman imperialists of the east, were ambitious to recover for themselves the western imperial heritage. Historians have an everlasting desire to overturn the verdicts of their predecessors, and it has become customary to claim that the ‘barbarian invasions’ of the late Roman Empire were neither barbarian nor invasions but migrations of not very aggressive Germanic peoples. Similarly, the Dark Ages are no longer seen as especially dark: if they were a sort of twilight in some areas, in others, such as the Ravenna of the mosaics, they were positively bright. In the endless debates between change and continuity – as if all history, even for the briefest period, is not a combination of the two – continuity in this instance is triumphant, except in Italy, where historians have a long memory of intruders and can recognize an invasion when they see one. Yet although the cities may have survived in a diminished state, along with certain aspects of Roman administration, civilization was altered throughout the western empire, and people became poorer. Archaeological evidence indicates that in Britain after the withdrawal of the legions economic life reverted not to the preceding Iron Age but to the Bronze Age before that: at the beginning of the fifth century the craft of pottery became extinct, and the technique of making it on a wheel was not retrieved for three centuries. As rulers, the barbarians – if such they were – started well. Little is known of the origins of Odoacer, who in 476 overthrew the last emperor of the west (a child called Romulus Augustulus), except that his father was a notable at the court of Attila, King of the Huns. Odoacer made himself king, governed largely in accordance with Roman practice, and resided in the emperor’s palace in Ravenna, which had been the imperial capital since the beginning of the century. Unfortunately he provoked the anger of the Byzantine emperor, Zeno, who persuaded Theodoric, chief of the Ostrogoths, to abandon his raids on the Balkans and instead invade Italy, where he would be permitted to make himself king as a vassal of Constantinople. Theodoric obliged with an invasion in 489, a long siege of Ravenna and the murder of Odoacer, his wife, his son and many of his followers. The reign of the new king began with a bloodbath and ended soon after the execution of the philosopher Boethius, who wrote his celebrated De consolatione philosophiae while waiting in prison for his death. Yet for three decades in between Theodoric ruled wisely and peacefully. He insisted on religious tolerance, refusing to favour either side in the controversy over Arianism, the heresy which denied the full divinity of Christ, and he managed to dissuade his victorious Goths from bullying the Roman population. His was the last kingdom to extend over the whole of Italy for over 1,300 years, yet it was even more transient than other regimes of the age, disappearing shortly after his death and leaving little visible trace apart from his imposingly primitive mausoleum at Ravenna. Theodoric had theoretically ruled Italy in the name of the Byzantine emperor on the Bosphorus, and it was one of Zeno’s successors, Justinian, who intervened again in Italy when Theodoric’s daughter was deposed and strangled by a cousin. The pretext was usurpation and murder, but the motive was the ambition of an emperor of the east to recover the empire of the west. Justinian ordered his general Belisarius to follow up his victories over the Sassanids in Persia and the Vandals in north Africa with an invasion of Sicily and the peninsula. The imperial army reached Ravenna in 540, thus making possible the creation of the great mosaic portrait which unsettled Momigliano: that of Justinian’s tough and capable wife, the Empress Theodora, robed in imperial purple in the octagonal church of San Vitale, a long distance from her past as an actress, a dancer and a single mother. Sporadically suspicious of his general, Justinian recalled Belisarius a few years later and left the rest of the ‘reconquest’ to be completed by Narses and his other commanders. After a war that lasted nearly twenty years, an emperor once again controlled Italy, this time through the exarchate (or viceroyalty) of Ravenna. Although the Byzantines were in fact Greeks and were phasing out Latin, they called themselves rhomaioi (Greek for Roman) and continued to do so for centuries to come; no one called anyone or anything Byzantine (derived from Buzas, Constantinople’s first name) until the sixteenth century, after their empire had collapsed. They regarded themselves as the heirs of classical and Christian Rome and believed that they had reversed the process of decline. Yet the war had been costly for the empire and ruinous for Italy, destroying the prosperity preserved by Odoacer and Theodoric. 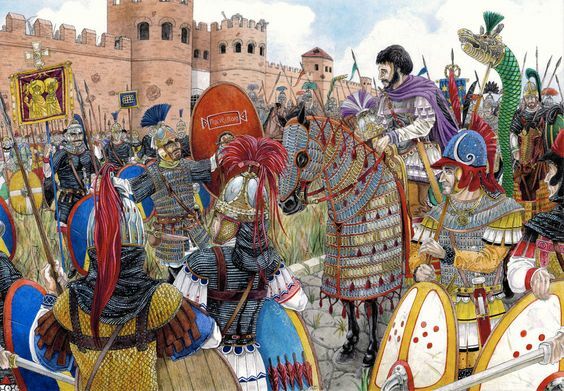 The genius of Belisarius may have given the illusion of a genuine imperial revival, but the Byzantines were not rich enough, strong enough or popular enough to keep the whole of Italy. In 568 Alboino, King of the Lombards, brought his Germanic people from the Danube Valley over the Julian Alps and into north-east Italy. Their advance was almost unopposed, and by the end of the following year they had captured all the cities north of the Po apart from Pavia, which they took in 572 and later made their capital. From there bands of Lombards ventured further south, eventually establishing independent duchies at Spoleto and at Benevento. Between the Lombard kingdom in the north and a reduced Roman-Byzantine exarchate in Ravenna, an uneasy coexistence survived for nearly 200 years, long enough for the heartlands of both to become permanently known as Lombardy and Romagna. Yet the Lombard king seldom exercised the far-flung authority of Theodoric. He was king of his own people (rex gentis langobardorum) not King of Italy, and wide areas of the south remained outside his control. Even in the Lombard areas he was frequently opposed by the dukes, not only of Spoleto and Benevento but also several others who governed the duchies or city-territories of the kingdom. So influential were these magnates that towards the end of the sixth century the Lombards experimented for a disastrous, anarchic decade with rule by dukes only. Byzantine power began to crumble in the north and centre of the peninsula early in the eighth century. In 727 Ravenna rebelled against the Byzantine prohibition of icons and killed the exarch; a generation later, it fell to the Lombards, thus ending its three and a half centuries of glory as the capital of the Roman Empire, of the Ostrogothic kingdom and of Byzantine Italy. Yet in the south the Byzantine Empire held on for longer than the Lombards in the north and even managed to expand its territory: at the beginning of the eleventh century its dominions in Italy included Apulia, Lucania and Calabria, all of them under the ecclesiastical control of Constantinople rather than Rome. Byzantium had possessed Sicily too, and Syracuse, one of the greatest cities of the Mediterranean, had briefly been its capital in the seventh century; but Arab invaders from north Africa had subsequently conquered the island, and Taormina, the last toehold, had capitulated in 902. Muslim armies also succeeded in seizing several cities in Apulia and in establishing an emirate based in Bari in 841. They were eventually driven out by Christian forces, and Bari became the imperial headquarters in Italy for a further two centuries. But in 1071 the Byzantines suffered two defeats at the extremities of their empire, in the east by the Seljuk Turks and in the west by Norman knights, who captured Bari and went on to build themselves a sturdy kingdom in southern Italy. Thus a great empire left the western stage, though the duchy of Venice remained within its orbit. Centuries later, Byzantium was condemned by Gibbon, Montesquieu and other writers of the Enlightenment as corrupt, deceitful, ineffective and tortuously bureaucratic; even the adjective Byzantine was used pejoratively, though the noun itself was later rehabilitated in the poetry of W. B. Yeats along with the sages and spirits of Constantinople. Yet it seems unfair to apply such insulting attributes to an empire that lasted a thousand years longer than its western partner and which was forced to expend much of its stamina resisting invasions of, among others, Persians, Huns, Bulgars, Goths, Lombards, Arabs, Normans, Venetians, crusaders, and both the Seljuk and Ottoman Turks. By resisting the Arab armies in the seventh and eighth centuries, Byzantium had preserved not only itself but also Christendom and the future of Christian Europe. Lombard kings were still expanding their territories in the middle of the eighth century, yet within a generation they had lost everything, including their crown. Pushing southwards down the peninsula, they alarmed the papacy which, since the exclusion of the Byzantines from central Italy, now controlled Rome and its hinterland. Pope Stephen II thus travelled to France, where he crowned the Frankish ruler, Pepin the Short, and in return received military help against the Lombards. He thereby inaugurated one tradition – of papal appeals for foreign help – which lasted till the nineteenth century, and another – of French invasions of Italy – which enjoyed an equally long history. Pepin twice brought an army into Italy to defeat the pope’s foes, but it was left to his son Charles, later known as Charlemagne, to descend upon Italy in 773, capture Pavia and sweep away the Lombard kingdom. The following year Charles journeyed to Rome, where he received the title King of the Lombards to add to that of King of the Franks, and on a subsequent visit to the city he had his son, another Pepin, crowned King of Italy. He changed the name of the kingdom from regnum langobardorum to regnum italiae and he kept its administration separate from the rest of his empire. Yet he was less interested in Italy itself than in its role in his plan of renovatio imperii or ‘the empire renewed’. The goal of his long, obsessive career as a warrior, which included eighteen battles just against the Saxons, was the recovery of the western Roman Empire, of which he considered himself the heir; and he did indeed conquer much of it, with the exceptions of Britain, most of Iberia and the Byzantine parts of south Italy. On Christmas Day 800 he returned to Rome to be crowned Emperor of the Romans, a title which greatly annoyed the other emperor in Constantinople. The alliance between the Franks and the papacy stimulated two potent ideas that crystallized into two extremely powerful institutions: the idea of a universal power, whose embodiment, the Holy Roman Empire, was only extinguished by Napoleon 1,000 years later, and the idea of territorial dominion of the popes, a reality that survived for even longer. Although the relationship may have been conceived in need and amity, it developed into a contest with fluctuating fortunes for both sides that ended only when the Emperor Charles V emerged victorious more than seven centuries later. This lengthy struggle was one of the determining factors in the saga of Italian disunity. The papacy owed its rise to a number of audacious claims: that St Peter was Bishop of Rome (for which there is little evidence), that Jesus had given him primacy over his other apostles (which is debatable – the apostles seem to have been unaware of it), and that Peter’s successors – if they were his successors – had received divine authority for their claims to universal jurisdiction over the Church and to superiority over the monarchs of western Christendom. Fortune favoured pretensions to papal supremacy, especially after three rival patriarchates (Antioch, Jerusalem and Alexandria) came under Muslim rule in the seventh century, and a fourth (Constantinople) went into schism with the Roman Church in 1054. Yet while the pope’s claims to be the ‘Vicar of Christ’ might conceivably be supported by a zealous interpretation of the New Testament, no one pretended that Jesus had said anything about Peter and his successors becoming rulers of earthly states. A fresh act of audacity was thus required to justify the papacy’s temporal power. In 754 the Frankish King Pepin had agreed to conquer and to give Pope Stephen territories in central Italy that had belonged to the exarchate of Ravenna. Known as the Donation of Pepin, the promise was confirmed and magnified (though largely unfulfilled) twenty years later by his son Charlemagne. Yet, as the Frankish kings had no rights in Italy at this time, it could be argued that their donations of former Byzantine land were invalid. An older and higher authority was needed, and thus the Donation of Constantine came into being, a document in which the formidable fourth-century Roman emperor, grateful for his recovery from leprosy, was supposed to have granted his papal contemporary temporal dominion as well as spiritual primacy over the Roman Empire of the west. Not until the Renaissance was this proved to be one of history’s most spectacular forgeries. By that time the document (the work of a papal cleric in the eighth century) had served its purpose of justifying the formation of the Papal States, a thick band of territory stretching from the Adriatic to the Tyrrhenian that kept the Italian peninsula divided until the second half of the nineteenth century. The popes expanded their territories from Rome and its environs – the so-called ‘Patrimony of St Peter’ – to include the duchies of Perugia, Spoleto and Benevento, the March of Ancona and finally the Romagna and parts of Emilia. In the process Christ’s differentiation between the realms of God and Caesar was forgotten; so was the sixth-century pope, Gregory the Great, who liked to be called ‘the servant of the servants of God’. No one would have considered a Renaissance pope the servant of anyone, even God. The strident struggles between the popes and the Holy Roman Empire date from the eleventh century. Before then both papacy and government descended into ages so dark that not even revisionists have been able to illuminate them. The empire of Charlemagne was divided between his grandsons and then his great-grandsons, and the dynasty’s generally absentee rule in Italy petered out in the reigns of Charles the Bald (875–7) and Charles the Fat (880–7). The century closed with invasions by the Magyars from Hungary, who ravaged the north, and stability did not improve over the following sixty years. In the long history of Italian disunity these decades are in a league of their own, a period dominated by magnates claiming to be king – and sometimes emperor – fighting other equally implausible claimants. One index of anarchy and upheaval is the list of claimants who succeeded in becoming kings of Italy between 888 and 962: one Marquess of Friuli, two Dukes of Spoleto, one Duke of Carinthia, one King of Provence, one Duke of Burgundy, two Kings of Arles, two Marquesses of Ivrea and one King of Germany. In the course of the ninth century, Carolingian rulers developed a military infrastructure aimed at supporting expeditions to ensure Frankish control of the central Danubian watergate, the confluences of the Drava, Sava, Drina, Tisza, and southern Morava rivers with the Danube. Itineraries suggest that many Carolingian campaigns against Moravia were launched from royal palaces in upper Bavaria, not from localities along the Danube. As for expeditions that did proceed along the Danube, those forces marched southeast from Vienna toward Baden and Pitten in the direction of Ptuj or via Sopron toward Szombathely and, then, on to Lake Balaton and Pécs. Military operations against the Moravians were often accompanied by grants to royal supporters involving land along routes leading southeast, the very routes that armies marching toward the Danubian watergate would have taken. Finally, it can be shown that Carantania became the most important lordship in this Frankish marcher organization. Prosopographical research demonstrates that almost all of the major figures in the marches were closely connected with Carantania. The preeminence of Carantania in the military system of the Carolingian marches is difficult to comprehend, if Moravian centers were located in the modern Czech Republic. Traditional military histories of the Middle Ages conclude that there was very little “art” involved in early medieval war. Though battles were sometimes bloody brawls, lack of discipline and the tactical inability to take fortresses resulted in indecisive campaigns. Should an invader manage to amass a superior force, his opponent simply withdrew behind the strong walls of fortifications and waited, perhaps making occasional sallies, until the invading army had exhausted available food from the surrounding countryside. Once the aggressor had used up his resources, he retreated. The defender, with stores of food carefully tucked away behind those walls, generally starved out the invader. The dean of Carolingian scholars, the late François L. Ganshof, did not share such views concerning the primitive nature of early medieval warfare. He believed that heavy cavalry was decisive in the creation of the Frankish imperium. 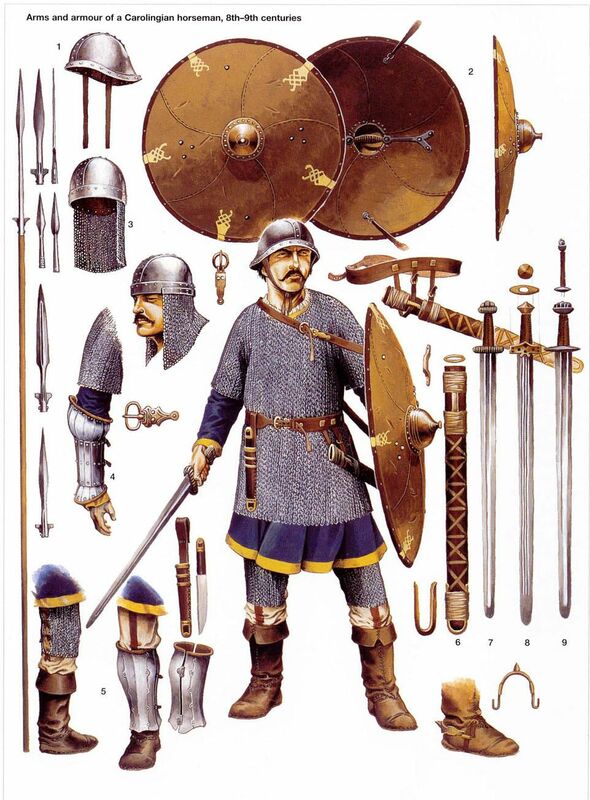 “Although few in number,” Ganshof wrote, “the units of armored cavalry had an extremely important role, tactical and perhaps strategic: they assured the Carolingian armies of superiority over the Saxons, the Slavs, the Avars, and probably the Danes.” Ganshof, however, left it to his student, J. F. Verbruggen, to formulate a comprehensive view of Carolingian strategy. Although the latter praised the studies of earlier scholars and insisted that Carolingian armies consisted of relatively small contingents of cavalry, Verbruggen also demonstrated that warriors of this period fought as units, that tactical flexibility was possible, and, most importantly, that commanders in the age of Charlemagne were capable of a grand strategy that was based on encircling pincers into enemy territory. Given the current state of research, it is no longer possible to assert that Carolingian warfare was chaotic and backward, and Karl Ferdinand Werner has shown that, on occasions at least, Carolingian armies must have been considerably larger than five thousand troops, which Ferdinand Lot thought was the most that Charlemagne ever had available for mobilization. If any element of Charlemagne’s armies must be identified as tactically decisive and such an exercise is inherently distorting when massive combined operations are undertaken over a period of more than four decades in diverse theaters of operation I would have to suggest that serious consideration be given to the “artillery,” the “engineers,” and those responsible for logistic support. It is inconceivable that such massive fortifications as those at Pavia, Barcelona, or Tortosa could have been taken without a siege train of significant size and sophistication. As a result of recent studies, a consensus concerning the nature of Carolingian warfare is emerging that stresses the organizational and strategic functions of Charlemagne’s war machine. According to current models, Carolingian conquests began with massive invasions of hostile territory, for which troops were summoned from the various Frankish realms. Carolingian pincers converged on enemy forces from several directions, which divided the energies of the defenders and which eased problems of supply. The objective of these operations was to ravish the opponent’s territory, to drive him from his fortifications, and to establish strategic strongholds from which Frankish garrisons under the command of margraves could assert effective control over the region. Once these tasks had been accomplished, the men constituting this large array returned to Francia for demobilization. From fortresses in occupied territory, smaller units (scarae) could then periodically be sent out by marcher commanders to reconnoiter and to harass resisters. After a region had been conquered, larger armies were necessary only when rebellions threatened the authority of the margraves. This model of Carolingian warfare is based on the realization that Charlemagne’s accomplishments rested upon strong foundations in the science of war. Military science is social science in that it requires a high degree of social organization to wage war. In the age of Charlemagne, success depended on tactical flexibility, good leadership, careful planning, steadfast perseverance and discipline in the execution of operational plans, and, above all, a sound system of logistics that allowed commanders to achieve battlefield superiority while operating far from their home bases. In spite of the many institutional weaknesses of the Frankish kingdom, Charles Martel, Pepin III, and Charlemagne commanded a formidable military machine that, at its best, was tactically flexible, had a hierarchy of command, and was capable of subjugating enemy territory after prolonged campaigns. Its men had a sense of group purpose, and its commanders were capable of strategic planning. Since it is no longer possible to believe that Carolingian commanders were swashbuckling adventurers who launched campaigns into distant regions without carefully considering operational problems, any study of Carolingian warfare in a given theater must begin with a discussion of the geography of the region under investigation and the tactical and strategic peculiarities presented by that terrain. Although much of the central Danubian basin was wild and inhospitable in the early Middle Ages, the course of the Danube and its major tributaries, the Drava and the Sava, facilitated the movement of armies from west to east. The frontier lordships that we are considering were mostly organized from Bavaria, but they also included the northern Italian march of Friuli, at least until the end of the third decade of the ninth century. Although forces operating from northern Italy were important in crushing the Avars and in putting down Slavic rebellions, Friuli declined in importance after the disgrace of the margrave Balderic in 828, and Bavaria became the base from which all major military expeditions into the central Danubian basin proceeded. The importance of Bavaria in Frankish attempts to control this region militarily is rooted in physical and historical geography. Wilhelm Störmer has pointed out that one should not look at ninth-century Bavaria from the point of view of the modern state in the Federal Republic of Germany, for in the early Middle Ages the duchy bearing that name was oriented much more toward south-central Europe than is the current Bundesland. In many ways this southeastern orientation of Carolingian Bavaria was predestined by the formation of the eastern Alps and its great rivers and by the modifications of this natural landscape through the genius of the Romans. Scattered evidence from late Roman and early medieval sources indicates that there was much navigation on the Danube and its major tributaries. In addition, the Bavarians inherited from imperial Rome an excellent network of overland communications, linking the province of Raetia Secunda with southeastern Europe via roads leading through intricate systems of Alpine passes. In the development of this system of communications, however, the power of imperial Rome bowed to the imposing terrain through which these roads passed. The main roads, which served primarily military purposes, followed courses dictated by rugged Alpine valleys. The structure of the Alps is such that it is difficult to proceed from north to south without ascending two or more passes. The Alps consist of several high ranges separated by deep valleys, cut by the raging torrents of the upper reaches of such great rivers as the Rhone, the Rhine, the Inn, the Enns, the Drava, and the Sava. Because major valleys in the Alps run east-west, they do not facilitate north-south movement. In spite of their reputation for building arrow-straight roads, Roman engineers in the Alps constructed highways conforming to the east-west configurations of the valleys. Even at that, the Romans did not succeed in establishing a system of communications that utilized all of the major Alpine passes over which roads have been constructed since the twelfth century. The eastern Alps posed formidable problems for the Romans when they tried to establish direct south-north connections from Italy to the Danube. The morphology of the Alps east of the Brenner consists of a series of ridges that radiate outward to the north and to the southeast like the ribs of an open fan, necessitating an intricate system of passes. Although the eastern Alps are not as high or as imposing as their western counterparts, their north-south extension is twice the width of the barrier in the west, requiring a more complicated intra-Alpine network of highways with multiple pass crossings. On the other hand, the difficulties in building roads in this region were somewhat lessened, because gaps between ridges form relatively low passes; however, these mostly connect parallel valleys with east-west orientations, facilitating movement in these directions rather than from south to north or vice versa. During the early Roman Empire even the Brenner, today the lowest and one of the most accessible passes leading from Italy to the north, had an east-west rather than a south-north orientation. In those days it connected the Inn valley with Venetia, Istria, Pannonia, and the Balkans rather than with the Po plain and, thence, with Rome. In fact, a direct north-south military road (via militaris) over the Brenner did not exist until the desperate circumstances of the third century forced Severi emperors to open one. Earlier commanders and officials had preferred the higher and longer, but more comfortable, via Claudia Augusta that ran northwest from Bolzano to Merano, over the Reschen Pass to the Inn River at Landeck, and then over the Fern Pass to Augsburg. The Bolzano-Innsbruck route over the Brenner was evaded earlier because of a steep defile formed by the Isarco river between Bressanone and Bolzano. Only the necessity of establishing a shorter route to the Danube to Regensburg finally motivated the sustained effort necessary to overcome this geographic obstacle. 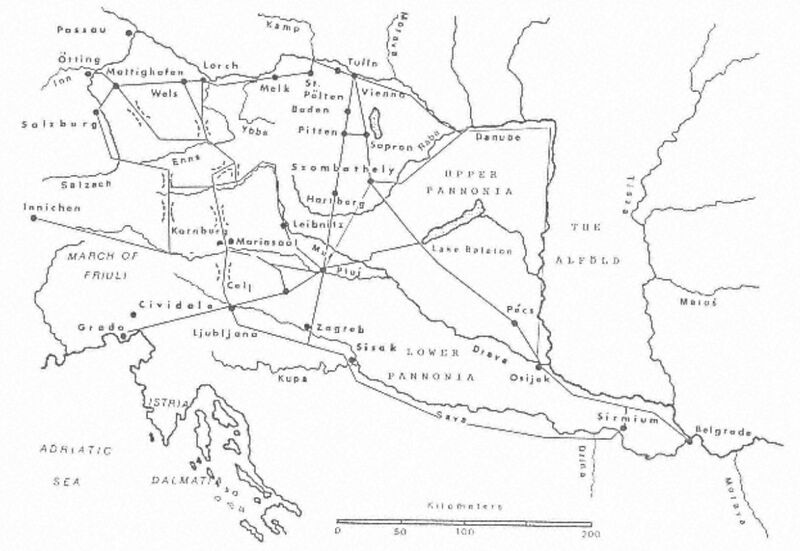 Even after the opening of a road linking the Brenner directly to the south, this pass remained a primary avenue of communication with points farther southeast, particularly as pressure increased along the middle Danubian frontier and as Constantinople eclipsed Rome as the first city of the empire. Because of its contemporary function as a main artery from north to south, we tend to forget that the Brenner was for millennia an important conduit for the movement of men, goods, armies, and ideas from east to west and vice versa. Yet such was the case. The Roman roads led from Aquileia on the Adriatic up the valleys of the Piave and the Tagliamento over passes to the Drava in the province of Noricum Mediterraneum. Routes running east-west crossed a narrow divide from the Drava-Gail river system to the Pusteria Valley (beginning near Dobbiaco) whence a gentle descent to Bressanone led ultimately to the Brenner road and to the Inn. From the vantage of northern Europe, the Brenner led to a network of roads that ran southeast to Sirmium. The important Roman towns on this eastern route through Noricum Mediterraneum were Dobbiaco, Spital, Virunum (near Klagenfurt), Celje, and Ptuj. At each of these locations, the east-west route was joined by roads connecting Venetia and Istria with critical points near the Danube. From Spital, for example, the Severi constructed a road over the Katschberg and Radstädter Tauern passes to the upper Enns. In the Mur Valley this route merged with another one from Klagenfurt via the Gurk Valley and the Turracherhöhe. From the upper Enns a link was established to Salzburg in the province of Noricum Ripense. 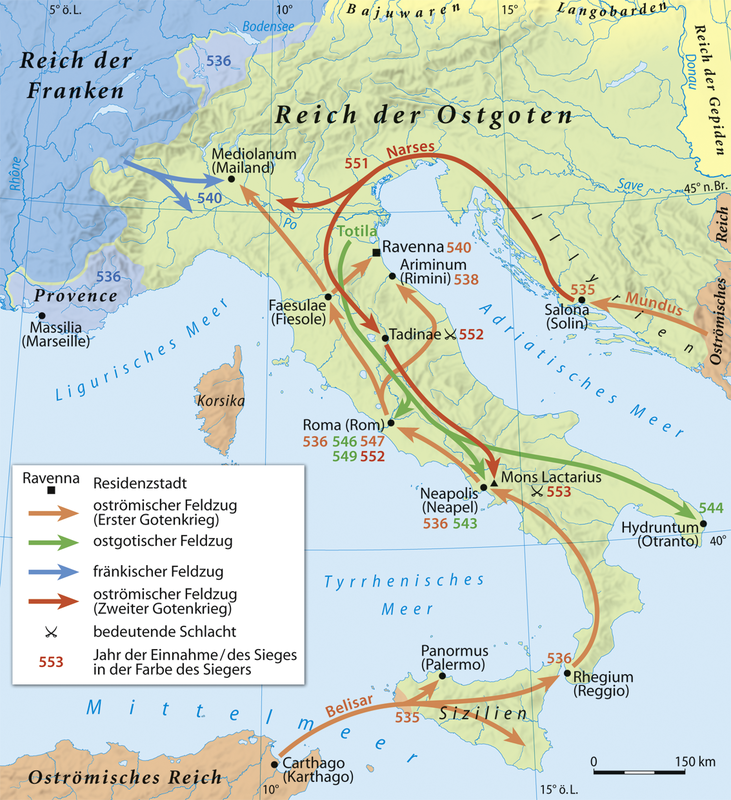 In addition, the Romans established a second connecting link from Klagenfurt to the Danube by way of Friesach, the low pass near Neumarkt, the Rottmannen Tauern and the Pyhrn passes, and finally terminating either in Wels or in Lorch. From the Drava crossing at Ptuj, an ancient bridge-head, an extremely important road skirted the eastern foothills of the Alps to Szombathely, a crucial junction, whence it branched to the garrison localities of Vienna and Petronel. Another road from Ptuj crossed Pannonia to Budapest via Lake Balaton, where it linked up with one leading from Szombathely to Sirmium by way of Pécs. Finally, an additional route ran southeast from Ptuj following the course of the Drava to Sirmium. This discussion shows that the roads through Noricum facilitated movement from west to east (and vice versa) rather than from south to north. The roads from the Danube through the Alps via Salzburg or Wels ran southeast toward Pannonia and the Balkans, taking advantage of the west-east contours of such valleys as the Enns, Mur, Gurk, and Drava. From Noricum Ripense all roads did not lead to Rome, many led to Sirmium, and, thence, to Constantinople. The southeastern orientation of roads through the eastern Alps also explains why the bishop of Lorch was in late imperial times the suffragan of the metropolitan of Sirmium. It is also important to note that there were no Roman roads crossing the Alps east of the Pyhrn Pass. The via militaris from Ljubljana to Vienna ran east of the Vienna Woods. Hence, there were no connecting links between Virunum, the chief city in Noricum Mediterraneum, and those parts of the modern province of Lower Austria between the Enns and the Vienna Woods. Nor was the Semmering Pass, which connects the Mur with the Leitha Valley, traversed by a road in Roman times. The lack of connecting links between the Drava and Lower Austria west of Vienna is due to the physical geography of that region. Although the Alps east of the Enns are not particularly high, they are extremely rugged and inhospitable. Deep gorges and craggy limestone bluffs constituted formidable obstacles to road construction even in later times. Descriptions of the remote character of this region in modern guide books do much to explain why it was bypassed earlier. In fact, it was colonized late and has never supported a large population. Whenever possible the Romans avoided such terrain and constructed their roads through relatively gentle valleys that received ample sunlight, where the inhabitants could support themselves with agriculture and settled husbandry. Only valleys friendly to human habitation could provision large armies on the march. Lower Austria did have a large Romanized population, but it was concentrated along the Danube and in the lower reaches of the fertile Traisen Valley. The only Roman road in Danubian Lower Austria ran through these densely populated riverside areas from Linz to Melk, whence it skirted the steep hills opposite the Wachau and reached the Traisen at Sankt Pölten, then turning once again toward to the Danube at Traismauer, where a cavalry unit was garrisoned in the late imperial period. From this point the road followed the Danube by way of Tulln to Vienna, where it was joined by the routes leading southeast via Baden or Sopron to the important junction at Szombathely. Thus, the connection between Noricum Ripense and Sirmium ran along the Danube to Vienna, then through Pannonia via Szombathely, Lake Balaton, and Pécs. Points along this ancient route to Sirmium appear prominently in the Carolingian sources. Frankish Bavaria, then, inherited an elaborate system of Roman roads that, following the natural contours of the Alps, led southeast. If Frankish expeditions in the ninth century were directed against a Moravia that lay somewhere near the watergate of the central Danubian basin, Carolingian armies would certainly have utilized these routes and commanders would have taken great pains to establish support facilities along them. Armies are cities in motion, and, as such, they have basic needs that must be satisfied each day. The momentum of an army, like that of a battleship, makes it difficult to change its direction. While armies can maneuver, of course, their freedom of action is always limited by considerations involving the availability of food and fodder; they run great risks when they venture into regions where men and animals cannot be sustained. Evidence of logistical infrastructures along routes leading from Bavaria in the direction of Belgrade provides a powerful argument supporting the southern Moravian hypothesis, for such a military organization would only make sense if Carolingian objectives involved control of the central Danubian watergate. In a stimulating book on the logistics of the Macedonian army, Donald Engels whose salient findings are also relevant to the age of Charlemagne demonstrated the dimensions of the supply problem that Alexander the Great’s armies faced when invading hostile territory. He concluded that three days was the maximum survival time for an army that had to carry all of its own food, fodder, water, tents, and armor through the most difficult terrain possible. To survive for four days a huge train of pack animals would have been necessary. Even at that, on the fifth day a crisis would occur, for by then men and beasts would have consumed all of the increased burden that the pack animals could have carried, even at half rations. Engels also discovered that the ratio between the army’s consumption rate and its carrying capability remains constant no matter how many personnel or pack animals are used to transport supplies, so a smaller force would find it no easier to carry its own supplies than a larger one. Moreover, it would not help if cavalry mounts packed supplies, for war-horses used in this manner cannot be ready for combat when they arrive at their destination, ”after the fourth day, they would be so much meat on the hoof.” By the fifth day the army would have suffered heavy casualties, leaving it in no condition to conduct a siege or to fight a battle. Thus, Engels limits the effective range of an army operating under such difficult circumstances to three days, or roughly ninety kilometers. However, this is a worst-case scenario that assumes that there were no provisions along the line of march, that the land was either barren or that it was not harvest time and/or it had been deserted by indigenous peasants who had taken their food supplies with them. This model also posits that there was no potable water along the route. While Alexander the Great, who operated in the arid Near East, dealt with such extremes, Carolingian armies would never have faced similar prospects in the central Danubian basin; thus, they had a greater range. Moreover, it should be obvious that a change in any variable of this model results in a considerable augmentation of the distance that an army could cover before running out of supplies. Engels estimates, for example, that if the army did not have to carry its own water, it could triple its range to nine days or three hundred kilometers. Moreover, large-scale Carolingian military operations against Moravia generally did take place in the summer and were accompanied by the pillaging of territory, so some forage must have been available for troops and animals. The availability of forage would, of course, have considerably increased the distances over which Carolingian armies could strike. The territory that an army could effectively dominate also varied with the physical features of the landscape. Navigable rivers exponentially increased the range of armies. Greater amounts of food, fodder, and water can be conveyed by boats (which need no nourishment) than by a train of pack or draft animals, each devouring a daily ration of ten pounds of grain and anequal amount of hay, which also had to be transported. 66 Barges moving downstream with the current proceed more quickly than a supply train, and, unlike animals, barges do not tire. The availability of rivercraft would also have facilitated the movement of such heavy equipment as siege engines, tents, arms, armor, picks, shovels, and so on. As we shall see, rivercraft operating on the Danube, the Drava, and the Sava considerably eased the problem of supply in the central Danubian basin. Terrain also determined the rate of march, a significant consideration for an army carrying all or even a portion of its supplies. Because daily rates of consumption are invariable, it is important for an army on campaign to reach its destination or some point of resupply as quickly as possible. Assuming the validity of a southern Moravian thesis, there were four routes from Bavaria to the Danubian watergate. One, of course, was the Danube itself. This route would have been the best assuming that Rastislav’s realm was centered on the Alföld. There were, however, some strategic problems with it, involving suitable localities for troops to disembark between Budapest and Belgrade. Also, river convoys could have been easily ambushed unless they were supported by terrestrially based forces moving along both banks of the river. Such forces would have had to endure a long and difficult march. And, once troops and supplies had landed, they still faced a march of several days over difficult terrain that would have favored the indigenous defenders before reaching the centers of a Moravian realm east of the Tisza. Assuming that Frankish forces landed near either Osijek or Novi Sad, they would have had two hundred kilometers in front of them (seven days) to reach Cenad, if that is where Rastislav’s capital was located on the Alföld. If they did not have to carry water, such an objective could be achieved. Nonetheless, the army would have been exhausted and isolated from its sources of support before arriving at its destination. A final difficulty involved the necessity of leaving some forces behind to guard the rivercraft. As we shall see, such forces and their boats were extremely vulnerable to surprise attacks. On strictly theoretical grounds, then, Eggers’s conclusion that it would have been difficult for Carolingian forces to have exercised a great deal of control over a Moravian principality east of the Tisza is plausible. A second route (a land one) was the most direct. It went diagonally through modern Hungary from Sopron to Pécs. This route would have been suitable for campaigns against a realm located either on the Alföld or near Sirmium. From Vienna this route followed the Roman road to Szombathely, then skirted the swamps west of Lake Balaton and veered south-eastward in the direction of Pécs. An army using this route would have had to transport its supplies or otherwise acquire them along the way. Since this route through Hungary was used by many crusading armies in a later and better documented era, we have some knowledge of the rates of march of those forces. During the Third Crusade, for example, Frederick Barbarossa’s army arrived in Vienna on May 26 or 27, but only reached Belgrade on June 29. This army, however, encountered frequent delays, so we need not assume that Carolingian units would have required an entire month to traverse four hundred kilometers from Vienna to Belgrade. The crusaders encountered different circumstances in the more developed twelfth century than those which Carolingian armies had to face in the ninth. For example, crusaders purchased their comestible supplies along the way. This fact did not, however, increase their rate of march; on the contrary, many of the delays experienced by these forces resulted from problems and expenses involved in the procurement of necessities. Yet Barbarossa’s army sometimes advanced at a rate of 18.8 miles per day, which roughly corresponds to Engels’s estimated daily average of thirty kilometers. On the other hand, it is probable that Carolingian armies on a prolonged march through Pannonia could have averaged no more than twenty-five kilometers. If we assume that Carolingian forces were able to maintain a pace of twenty-five kilometers each day on the march through Pannonia, it still would have taken them fifteen days to reach Sirmium from Vienna (between 350 and 380 kilometers). Thus, Sirmium was well beyond the range of a self-sufficient army that had to carry its supplies from bases near Vienna. Frankish forces using this route could, then, only have invaded the region bounded by the lower reaches of the Drava and the Sava if there were adequate support facilities along the way. A Carolingian army operating from Szombathely, on the other hand, would have been 85 kilometers closer (approximately eleven days from Sirmium); a base near the western end of Lake Balaton would have been 65 kilometers closer still (within the nine days); and a place of resupply at Pécs would have been only 120 kilometers (five days) from the ancient capital on the lower Sava. As we have seen, a force that did not have to carry its own water could sustain itself for nine days. Thus, an army moving through Pannonia and supported by existing facilities as far as Pécs (or even Zalavár) would have been within striking distance of Sirmium, even if it had to carry its own food and fodder from that point on. This task, however, would not have been necessary, for, southeast of Pécs, forces could have been refurbished by boats operating on the Drava and Sava rivers. Since an army marching overland from Sopron to Sirmium via Pécs could be resupplied by rivercraft on the Drava at Osijek and provisions and siege engines could be transported on the Sava to the very walls of Sirmium itself, we must conclude that the ancient capital was within reach of an army that began its march to the southeast from Vienna, provided that the key points of supply in Pannonia (Sopron, Szombathely, Zalavár, and Pécs) were in the hands of Frankish margraves or indigenous Slavic leaders who supported them and that the upper reaches of the Drava and Sava in Carantania were in friendly hands. From localities in Transdanubia the troops could be refurbished with food, fodder, and potable water. Siege and noncomestible equipment could be ferried down the Drava and Sava in the company of troops entering Pannonia from bases in Carantania. If Carolingian armies were indeed able to conduct effective military operations against a Moravian principality situated between the lower Drava and Sava, or one east of the Danube and the Tisza, there must have existed a logistical infrastructure extending along the overland route from Vienna to Szombathely and extending via Zalavár as far southeast as Pécs. A point of supply near the west end of Lake Balaton (Zalavár), two and a half days from Szombathely, would have eased considerably the movement of an army in the direction of Pécs, approximately one hundred kilometers farther southeast. The pivotal strongholds in such a system of logistics would have been Sopron and Szombathely, where the hills of Burgenland give way to the rolling country of western Hungary. Szombathely would have been especially important. In addition to controlling the road leading southeast to Balaton and Pécs, it also straddled the ancient via militaris leading southwest to the Drava crossing at Ptuj, a march of four days (slightly more than one hundred kilometers). Ptuj, the locality that would have ensured communications between forces moving southeast from Carantania with those operating in Pannonia, was also a point from which the Pannonian army could have been resupplied by rivercraft on the Drava. A communication and supply system linking forces advancing through Pannonia with those moving along the Drava and Sava from Carantania would have been indispensable to support armies invading the region near Sirmium. This discussion leads us to a consideration of the two remaining routes. These were the ones leading from Bavaria through the Alps to the region known in ninth-century sources as Carantania (the modern Austrian provinces of Carinthia and Styria and the South Slavic Republic of Slovenia), whence one route followed the Drava and the other the Sava south-east. Although these rivers could only be reached after grueling marches over passes, once their headwaters had been attained, the routes along them had an advantage insofar as fluvial navigation could then be utilized to supply armies proceeding southeast. Utilizing the Drava and the Sava, armies could advance rapidly toward the central Danubian watergate. Control over these two routes was, then, absolutely essential for Frankish military operations against a Moravian principality located in southeastern Pannonia. As we shall see, Carolingian expeditions against the realms of Rastislav and Zwentibald had little chance of success when East Frankish kings lost control of Carantania. In general, there is little evidence of change or advances in fortification in northern and central Europe during the period between the collapse of the Roman Empire and the ninth century. The infrastructure of the Roman world did not exist and many of the Roman city walls fell into disrepair. In places walls were deliberately demolished, either for a ready supply of dressed stone or to make way for new structures. Settlements often moved to sites near the former Roman towns but outside the walls, as in the cases of York and London. Nevertheless, many of these returned to the former Roman sites in the ninth and tenth centuries, and in some places the Roman walls were still defensible. In 946 they proved too much for the combined armies of King Louis IV and King Otto I, who abandoned their siege of Senlis (defended by the troops of Hugh Capet, later the first Capetian king of France) after deciding that an assault would be too costly. In 985 King Lothar (of France) had to use an arsenal of machines and a siege tower to overcome the third-century walls of Verdun. In the previous century the same walls had saved the city from sack by the Vikings. During the Viking Era fortification became much more widespread and previously undefended trading emporia were given defenses. An obvious explanation for this might be the advent of large-scale raiding by the Vikings and later the Magyars. Italy was also part of the Frankish world after 774 and suffered heavily from Saracen raids and later invasion. Undoubtedly this was a contributory factor, but there is evidence of a change in attitude in the Frankish Empire before the ninth century. The Carolingians made a conscious effort to imitate Rome, and this included Roman architectural styles, and their conquests brought them into close contact with Byzantine fortifications in Italy, themselves descended from the Roman model. The Franks needed new forts to secure their hold on conquered territories. In areas formerly controlled by the Romans, such as southern Germany, earlier fortifications were certainly reused and repaired, but the defenses of these sites have often been difficult to date, if they have been researched at all. Former Roman villae were also used both by the Agilolfing dux Tassilo (r. 747–788) and by his Frankish successors in Bavaria. Until very recently it was wrongly assumed that Frankish and Slavic fortifications could be differentiated on the basis of style, the assumption being that the Franks built more advanced defenses from stone. Many of the early fortifications on the eastern frontier with the Slavs were of similar type to their enemies’. The construction of what became a deep belt of fortresses began in the Carolingian period and continued under the Ottonians. In Germany during the tenth century a huge building programme was begun under the Saxon dynasty. This may have been initiated by Henry I’s Burgenordnung of c. 925, although it has proved very difficult to link any known fortifications with it. The style of fortification on the eastern frontier varied. One object was certainly defense of rural settlements against raiders, particularly the Magyars, but also the Slavs. In the reign of Otto II similar defenses were organized on the comparatively short Danish frontier. The Viking threat posed an altogether different problem than frontier raids by the Slavs, not least because the Vikings were capable of penetrating well inland up navigable rivers. An interesting solution to this problem was attempted by Charles the Bald. Carroll Gillmor suggests that the idea may have struck him when he built a bridge across the Marne to block the retreat of some raiders. When he held an assembly at Pitres in 864 he ordered the building of fortifications on the Seine to prevent the Northmen from passing further upriver. The idea was a bridge with powerful fortifications of wood and stone at each end. The site was Pont-de-l’Arche. Excavation has revealed a square enclosure with 270 meter-long sides on the north bank. Originally there was a clay rampart, but this was cut away to place a line of 4.5-meter tree trunks, which were then faced with stone on the outer side. Unfortunately there is no way of knowing the height of the work, as it was leveled in the later Middle Ages. The earth and timber rampart with stone facing was no more advanced than many fortifications had been in the Iron Age, but a more serious problem may have been that it was built very slowly and not properly garrisoned, despite the king’s demands. Another work was built at Les Ponts-de-Cé on the Loire, but that seems to have been ineffective as well. Elsewhere Charles did contribute to the defense of the realm. In his reign and those of his successors Carloman and Charles the Fat, many old walls of towns were repaired and new fortifications built round monasteries, including St. Bertin, which subsequently saw off a Viking attack in 891. However, it was not only the king who began to build forts, although this was supposed to be a royal prerogative. Although Charles had ordered the destruction of private fortifications at Pitres, he was unable to prevent unauthorized construction and a dangerous trend (from the royal point of view) had begun. Similar measures against Viking attacks were taken on the Rhine and Meuse in East Francia after Danish attacks in 863, 880–881 and 884–885. Town defenses were strengthened, the royal palace at Nijmegen was given ramparts, and a castle was built by Duke Henry at Duisburg. In Flanders, more or less an independent polity at this time, Bruges and Ghent were fortified by Count Baldwin. Most interesting in this region, however, are five ninth-century circular earthworks with palisades on the islands off the coast of Zealand–Flanders. They had two roads across the site, meeting at the middle, and varied from 144 to 265 meters in diameter. Since no occupation layer was found, they were probably refuges. Only Middelburg on Walcheren survived this period to become a settlement. In the central Netherlands another unusual fortification was the Hunnenschans, a late Carolingian meter-high horseshoe-shaped earthwork with a palisade, enclosing an area 100 meters in diameter. In 2007 a further earthwork was discovered at Appel, just to the west, while to the south is another, Duno, with a roughly semicircular series of banks and ditches. Both appear to have been tenth century. There are uncertainties about the excavation and recording of data at Duno and Hunnenschans, but Appel at least seems to have had links to the counts of Hamaland and bog-iron production. Fortifications also proliferated in the tenth century throughout the kingdom of Germany, and not only in the Slavic frontier zone, where there were hundreds of them. Many continued to resemble earlier Saxon, Frankish and Slav fortifications, while some were simple palisaded enclosures. Fortifications built by nobles often followed a similar pattern to royal ones, if on a smaller scale. There can be no doubt that there was a strategy of “defense in depth” on the eastern frontier. The East Frankish and German rulers were well aware that individual fortifications had a limited capacity to hinder the movement of enemy forces, just as they knew that it was difficult to stop enemy forces from “crossing the frontier.” Periods of intense construction of fortifications on the frontier appear to coincide with preparation for or consolidation of advances into Slavic territory, especially by the Ottonian kings, or anticipated trouble from the east.4 However, it has to be borne in mind that there were other reasons for fortification building. The kings of the Saxon Ottonian dynasty were keenly aware of the need to project their image and power as kings and emperors, and one way of doing this was to build imposing structures. Other powerful landowners also built fortifications for the same reasons; even if they were not able to compete with the German kings, they could still imitate them and compete with each other. Many German scholars trace the origins of the “classic” medieval fortress types to the eleventh century, although the disappearance of many earlier fortifications has distorted the picture somewhat. The larger fortresses in Germany, often known as hohenburgen, had inner and one or more outer enclosures, not dissimilar in principle to many earlier German and Slavic fortifications. Whenever possible they were constructed on higher ground. However, a new development was the appearance of the Bergfried, a free-standing tower, either on the most vulnerable side of the main enclosure as an additional defense, or in the center of the enclosure and unattached to it. Usually the Bergfried was tall and slender and lacked windows; it was not designed for permanent habitation, but as a last resort if the main or outer defenses were overrun. Increasingly these fortifications were built or rebuilt of stone. According to Adam of Bremen, the archbishop of Hamburg planned to encompass the entire town of Hamburg with stone walls, but he died having built only a fortified stone structure with towers and battlements. This was certainly a response to the threat from the Slavs, which had increased after the revolt of 983. In 1008 Henry II also fortified Bamberg with walls, outworks and a strong tower. By contrast, the defenses at Meissen were probably made of wood, as the Slavs attempted to set light to them in 1015. Others were smaller, ringforts or square palisaded enclosures with or without a ditch. They too frequently included a Bergfried. Alternatively, towers could be built entirely on their own. Most were built of wood in this era, but stone towers were constructed on similar principles both before and after 1100. These towers were more common in low-lying areas, where they also fulfilled the function of watchtower. The most significant change in fortification style in the eleventh century was the development of what we now call the motte-and-bailey castle, which originated in West Francia. It consisted of two elements, a mound (motte) surrounded by a ditch, on which some form of tower or fortified house was usually built, often with a palisade around its base, and an outer yard (bailey) enclosed by a palisade and ditch. The bailey was usually large enough to enclose several buildings and animals if necessary. Sometimes there was more than one bailey. In our period the defenses were almost invariably of wood. The main strength of these castles was their earthworks and ditches with their steep banks: the wooden fortifications alone would not have presented a serious obstacle, but the whole structure was very difficult to assault, although the wood was obviously vulnerable to fire in the right conditions. In addition, the castles were relatively cheap and easy to build and did not require a skilled labor force. However, medieval accounts suggesting that mottes could be thrown up in a few days either exaggerate the ease of building or refer to very small mottes. Larger ones may have taken many months to build. Various reasons have been suggested for the spread of motte-and-bailey castles in the eleventh century: for instance, that they were used widely by the Angevin counts as defense against Vikings, that they arose as a result of “feudalization” (the fragmentation of power and the growth of fiefdoms), and even that the design may have been Viking in origin, hence its widespread use in the territory they were granted, Normandy. Since there is no evidence whatever for such a design in Viking Scandinavia, the last explanation is improbable. Even if correct, the argument that motte-and-bailey castles appeared precisely where fiefdoms did in the feudalization process, in northern Europe, gives a reason for the spread of castles, but not the appearance of a new type of castle. According to D.J. Cathcart King, the earliest known example of the motte-and-bailey design was at Les Rues-des-Vignes (medieval Vinchy), Nord-Pas-de-Calais, known of from 979. Fulk Nerra and Geoffrey Martel, who reigned as counts of Anjou 987–1040 and 1040–1060, used various types of fortification, as often to secure control of territory they had gained as much as to defend their frontiers against Vikings and neighboring lords. They constructed stone towers as well as ringforts and mottes. The deciding factor was probably the speed at which they had to be constructed. The strategy of constructing forts rapidly after an initial advance into enemy territory and then improving them later was used by the Normans in England. Nevertheless, on the continent the simple ringfort continued in use, although some were converted with the addition of a motte. During the Norman conquest of England it seems that ringworks were often built first and converted to motte-and-bailey castles later. Bernard Bachrach has highlighted Fulk Nerra’s strategy of building each castle no more than 35 kilometers from the nearest—in other words, within a day’s ride. In England and Wales this strategy was particularly useful to Duke William for securing control of a hostile territory. Each motte-and-bailey castle built by the Normans after their invasion was designed so that a small number of occupants could control the immediate district or estate and be safe from attack, but were also within reach of relief from neighboring castles. In addition, the appearance of the castle would have had a powerful intimidating effect on the English. An interesting aspect of William’s castle-building is that most of the sites were new, and in many regions such as Somerset it seems that the old Anglo-Saxon burhs were initially avoided. The most likely reason is the Norman perception of them as centers of resistance, where large concentrations of hostile people were available to attack any garrison. This was not unreasonable, as the fate of the garrison at York in 1069 showed, although there the English had Danish help. The break-up of old estates and the creation of new ones also meant that central locations for control of estates changed, to places where castles were needed by the new landowners. The entry for the year 885 in the French Annals of St Vaast begins with the chilling phrase: “The rage of the Northmen was let loose upon the land”. It was an all too accurate assessment. As soon as the winter snows had melted, a frenetic series of Viking raids hit the French coast and continued with a ferocity not seen for half a century. This particular year was especially demoralizing because the Frankish population had believed that they had gained the upper hand against the raiders. Four years earlier, the Franks had met the Norse in a rare pitched battle and slaughtered some eight thousand of them. For several years the threat of attack had receded, but then in 885 the Norse launched a full-scale invasion. Viking attacks were usually carried out with limited numbers. They were experts in hit and run tactics, and small bands ensured maximum flexibility. That November, however, to the horror of the island city, more than thirty thousand7 Viking warriors descended on Paris. From the start, their organization was fluid. According to legend, a Parisian emissary sent to negotiate terms was unable to find anyone in charge. When he asked to see a chieftain he was told by the amused Norse that, ‘we are all chieftains’. There was a technical leader – traditionally he is known as Sigfred – but not one the Franks would have recognized as ‘King’. It was less of an army than a collection of war bands loosely united by a common desire for plunder. The Vikings launched an attack hoping to catch the French off guard, but several days of intense fighting failed to break through the Parisian defenses. The resulting siege, which lasted for a year, was ultimately unsuccessful, but it gave Europe its first glimpse of the man whose descendants would dominate both ends of the continent, and whose distant relative still sits on the English throne. Known to posterity as Rollo (the Latin version of the Norse Hrolf), he was a minor leader, probably of Norwegian8 extraction. According to legend he was of such enormous size that the poor Viking horses couldn’t accommodate him,9 and this earned him the nickname Rollo the Walker (Hrolf Granger), since he had to go everywhere on foot. Like all the Vikings, Rollo had been drawn to the siege by the very real prospect of making a fortune. Forty years before, the legendary Norse warrior Ragnar Lodbrok had sacked Paris with fewer men, returning home with nearly six thousand pounds of silver and gold courtesy of the terrified French king. All of those present had undoubtedly been brought up on stories about Ragnar’s exploits, and there may even have been a veteran or two among the gathered warriors. This was their chance to duplicate his exploits. If Rollo distinguished himself at Paris, it was in his determination. When it became apparent that an early victory wasn’t possible, many of the Norse began to drift away towards easier targets. By March of the next year, morale among the Vikings was so low that the nominal leader, Sigfred, reduced his demand to sixty pounds of silver – a far cry from Ragnar’s six thousand – to lift the siege. However, a rumor that the Frankish emperor, Charles the Fat, was on his way with a relief army stiffened the will of the Parisians and they refused. Sigfred held out another month, and then gave up, leaving Rollo and the other lesser leaders on their own. The Frankish army finally arrived in October, eleven months after the siege began, and scattered what was left of the Vikings. Rollo’s men were surrounded to the north of Paris at Montmartre, but Charles the Fat decided to negotiate instead of attack. The province of Burgundy was currently in revolt, and Charles was hardly a successful military commander. In exchange for roughly six hundred pounds of silver, Rollo was sent off to plunder the emperor’s rebellious vassal. It was an agreement that suited both of them, but for Rollo, the dream of Paris was too strong to resist. In the summer of 911 he returned and made a wild stab for it, hoping smaller numbers would prevail where the great army had failed. Not surprisingly, Paris proved too hard to take, so Rollo decided to try his luck with the more reasonable target of Chartres. The Frankish army had been alerted to the danger and they marched out to meet the Vikings in open battle. A ferocious struggle ensued, but just when the Vikings were on the point of winning, the gates flew open and the Bishop of Chartres came roaring out, cross in one hand, relic in the other, and the entire population streaming out behind him. The sudden arrival turned the tide, and by nightfall Rollo was trapped on a hill to the north of the city. The exhausted Franks decided to finish the job the next morning and withdrew, but the crafty Viking was far from beaten. In the middle of the night he sent a few handpicked men into the middle of the Frankish camp and had them blast their war horns as if an attack were underway. The Franks woke up in a panic, some scrambling for their swords, the rest scattering in every direction. In the confusion the Vikings slipped away. With the dawn, the Frankish courage returned, and they hurried to trap the Vikings before they could board their ships, but again Rollo was prepared. Slaughtering every cow and horse he could find, the Viking leader built a wall of their corpses. The stench of blood unnerved the horses of the arriving French, and they refused to advance. The two sides had reached an effective stalemate, and it was at this point that the French king, Charles the Simple, made Rollo an astonishing offer. In exchange for a commitment to convert to Christianity, and a promise to stop raiding Frankish territory, Charles offered to give Rollo the city of Rouen and its surrounding lands. The proposal outraged Frankish opinion, but both sides had good reason to support it. The policy of trying to buy off the Vikings had virtually bankrupted the Frankish Empire. More than a hundred and twenty pounds of silver had disappeared into Viking pockets, an amount which was roughly one-third of the French coins in circulation. There was simply no more gold or silver to mint coins, and the population was growing resistant to handing over their valuables to royal tax collectors. Even worse for Charles, the Viking raids had seriously undermined his authority. It was impossible for the sluggish royal armies to respond to the Viking hit and run tactics, and increasingly his subjects put their trust in local lords who could offer immediate protection rather than some distant, unresponsive central government. The authority of the throne had collapsed, and now it was the feudal dukes who held real power. If Charles allowed another siege of Paris he would lose his throne as well. Here, however, was a solution that promised to make all the headaches go away. Who better to stop Viking attacks than the Vikings themselves? By gaining land they would be forced to stop other Vikings from plundering it. The nuisance of coastal defense would be Rollo’s problem, and Charles could focus on other things. For his part, Rollo was also eager to accept the deal. Like most Vikings he had probably gone to sea around age fifteen and now, perhaps in his fifties, he was ready to settle down. Local resistance was becoming stronger, and there was little more to be gained in spoils. After decades of continuous raiding the coasts were virtually abandoned, and wandering further inland risked being cut off from the ships. This was an opportunity to reward his men with the valuable commodity of land and to become respectable in the process. Rollo jumped at the chance. The Treaty of Saint-Clair-sur-Epte, as it came to be known, created the Terra Normanorum – the land of the Northmen. This treaty of the Northman’s Duchy, or Normandy, was formally agreed to at a meeting between the two protagonists. The Viking warlord agreed to be baptized together with his entire army, and to perform the ceremonial act of homage to King Charles. Unfortunately, this last part was carried out with a certain lack of grace. The traditional manner of recognizing a feudal lord was to kiss the royal foot, but Rollo wasn’t about to do any such thing. When Charles stuck out his foot, Rollo ordered one of his warriors to do the deed for him. The huge Norseman grabbed the king’s foot and yanked it up to his mouth, sending the hapless monarch sprawling onto his back. It was, had they only known, a fitting example of the future relationship of the Norman dukes to their French overlords. Charles hoped that his grant of land was a temporary measure that could be reclaimed later. Such things had been done before and they never lasted beyond a generation. 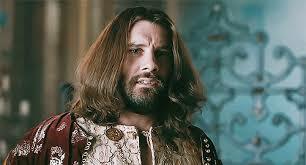 In Rollo, however, he had unwittingly found a brilliant adversary. Rollo instantly recognized what he had; a premier stretch of northern France with some of the finest farmland in the country. His genius – and that of his descendants – was a remarkable ability to adapt, and in the next decade he managed to pull off the extraordinary feat of transforming a footloose band of raiders into successful knights and landowners. Rollo understood, in a way that most of those around him did not, that to survive in his new home he had to win the loyalty of his French subjects. That meant abandoning most of his Viking traditions, and blending in with the local population. He took the French name Robert, married a local woman, and encouraged his men to do the same. Within a generation the Scandinavian language had been replaced by French, and Norse names had virtually died out. However, the Normans never quite forgot their Viking ancestry. St Olaf, the legendary Scandinavian king who became Norway’s patron saint, was baptized at Rouen, and as late as the eleventh century the Normans were still playing host to Viking war bands. But they were no longer the raiders of their past, and that change was most clearly visible in their army. 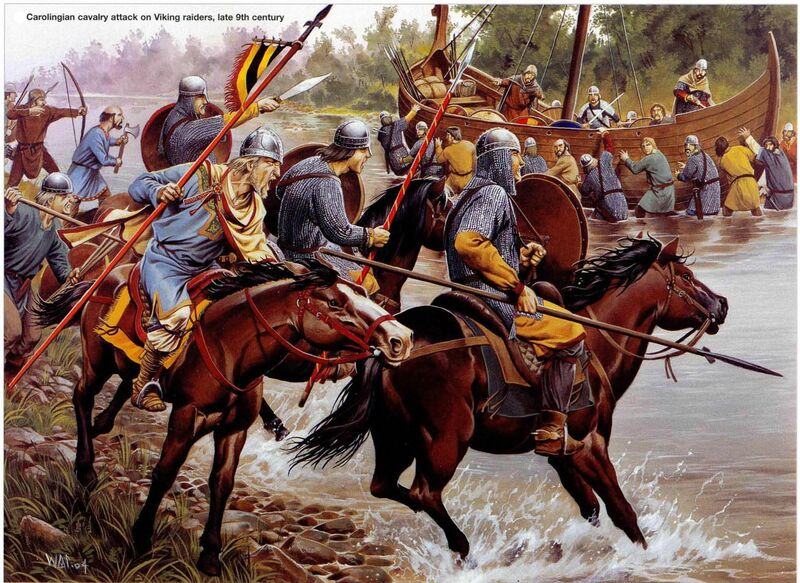 Viking forces fought on foot, but the Normans rode into their battles mounted. Charges from their heavy cavalry would prove irresistible, and carry the Normans on a remarkable tide of conquest that stretched from the north of Britain to the eastern shores of the Mediterranean. One final change took longer to sink in, but was no less profound. Christianity, with its glittering ceremonies and official pageantry, appealed to Rollo probably more out of a sense of opportunity than conviction. His contemporaries could have been forgiven for thinking that Odin had given way to Christ suspiciously easily. The last glimpse we get of Rollo is of a man hedging his bets for the afterlife. Before donating a hundred pounds of gold to the Church, he sacrificed a hundred prisoners to Odin. Christianity may have sat lightly on that first generation of Normans, but it took deep root among Rollo’s descendants. There was something appealing to their Viking sensibilities about the Old Testament – even if the New Testament with its turning the other cheek wasn’t quite as attractive – and they took their faith seriously. When the call came to aid their oppressed brothers in the East, they would immediately respond; Norman soldiers provided much of the firepower of the First Crusade. 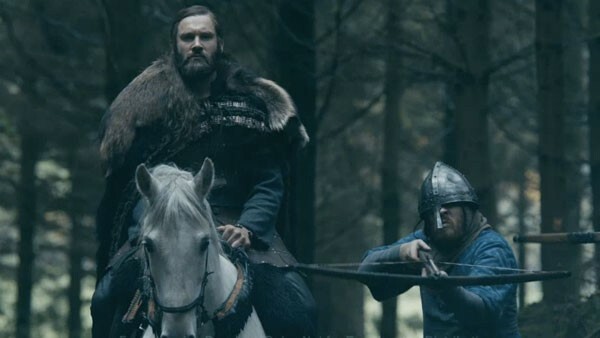 When Rollo finally died around 930, he left his son an impressive legacy. He had gone a long way towards turning his Viking followers into Normans, and turning an occupied territory into a legitimate state. For all that, however, troubling clouds loomed on the horizon. Normandy’s borders were ill-defined, and it was surrounded by predatory neighbors. Its powerful nobles had bowed to the will of Rollo while he was alive, but they saw little reason why they should extend the same loyalty to his son. Most worrisome of all was the French crown, which eyed Rouen warily and was always looking for an excuse to reclaim its lost territory. Rollo had laid the foundation, but whether Normandy would prosper, or even survive at all, was up to his descendants.